Nate and I took a wander out to Ardmore, PA, a few weekends ago. 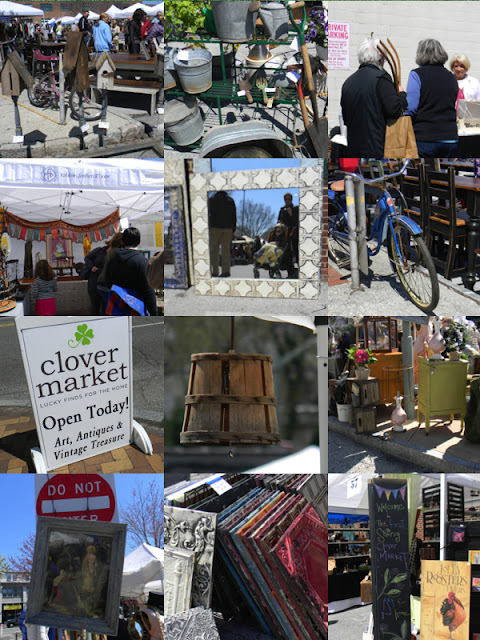 I had learned of a flea market/vintage/Etsy/Craft Fair event that happens once a month April-May-June and then again in the Fall, called, Clover Market. 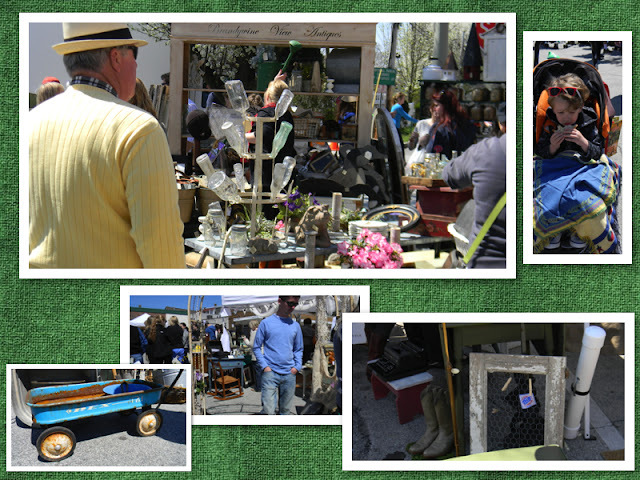 It was such an amazing find - about one hundred vendors selling everything from vintage antiques to up-cycled and recycled crafts and furniture. There were people selling hand-made clothes, printed cards and posters, jewelry and baby items. Tin roof tiles, vintage buckets, bottles, baskets and bicycles. We spent a few hours walking around, checking out the sights and perusing the stalls. Nate and I had the day to spend on our own, Liz was working all day at her various jobs, so I figured the drive out to the suburbs of Philadelphia might be a good way to spend the morning for us. Nate was such a good boy in his stroller, being patient and not begging to get out to run around. He didn't grab at items and he ate snacks and lunch without much prompting. He was even helpful in selecting a gift for Liz's birthday - we found an old stained glass window pane for our house, along with an old square tin bunt pan with 3 vintage square citron glass bottles. Clover Market bills itself as Lucky Finds for the Home. I'll say! The next Clover Market will be on May 19th - Make your plans now to go there. It's worth the trip. Looks like a ton of great junk! Now I'm curious about what you found for Liz Bday present. Association of Food Bloggers- Seemed like it would be up your alley. I'll have to take a photo of the window we bought, along with the tine bunt pan and bottles. we really had a blast and they have food vendors too. If I can, I'll be going to the may 19th market. They're expanding to Chestnut Hill too! Not sure about the recipe- didn't hear about it. Got any deets?